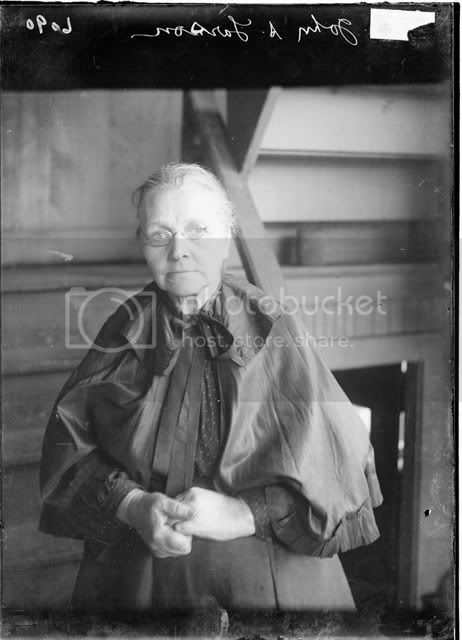 Rich Vitton of the Forest Park Historical Society has sent us an update on Belle Gunness, the murderess about whom we blogged earlier in the week. Belle, if you’ll recall, was exhumed from her resting place at a cemetery in Forest Park to see if the headless corpse was actually hers. According to Andrea Simmons, who is handling the DNA testin in Indiana, there’s about a 50-50 chance that the tests will work out. DNA samples have been sent to five different labs, but they feel that there may not be enough DNA left for conclusive results. But fear not – there’s a backup plan! Permission has been obtained from Gunness’ descendants to exhume Belle’s sister, who is buried in California, so that more DNA can be extracted. Also buried in California is another target for exhumation – the body of Elizabeth Carlson, who was awaiting trial for poisoning at the time of her death. Many believed at the time that she wasn’t Elizabeth Carlson at all, but Belle Gunness herself! The results of the test should be known in May or June! My mother's uncle, Joe Maxon, was the caretake of Belle's farm at the time of the fire. He escaped because he didn't eat the poisoned oranges she gave him and the children after supper. My family firmly believes that is not Belle in the grave in Illinois. I haven't heard anything – my guess is that the results haven't yet been released. I'd actually venture a guess that they're coming up inconclusive. Is there any more information on the DNA test that were sent out many months ago? I can not seem to find anything on the internet.